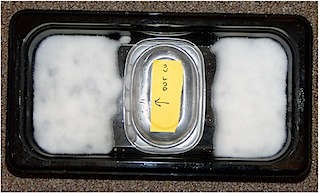 We used 12 oz of dry roasted soy bean halves and 3 g of Gem Culture starter (Rhizopus Oligosporus) . The Rhizopus Oryzae offered by some suppliers is apparently not able to sporulate as easily as Oligosporus - if at all. We would be afraid of the long incubation times mentioned for getting it to sporulate - what else would it grow during that time? We incubated for 30 hrs. This extra time lets the mycelium finish and make black spores - which is what we are after. 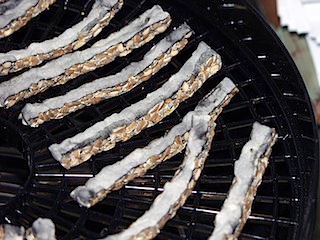 Below are the dried slices. 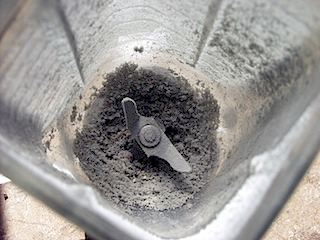 Then we took the slices and put them into a blender and turned them into powder. This was then put through a strainer to get rid of the larger pieces and we weighed the remains. Then we added double the amount of rice flour, mixed well and used this as our starter for a test batch. 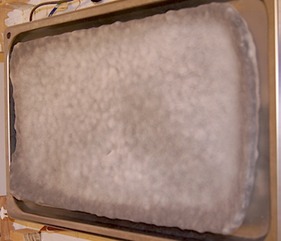 The rest of the dried slices were put into an air tight container and stored in the refrigerator. We used 1/2 cup of soybeans to do a side by side test of our culture against our usual tempeh starter (Gem Cultures) and it shows that our culture (on the left) is a bit stronger (darker). So we could use a bit less when we make our next batch of tempeh - or when we make our starter mix with rice flour, we could increase the amount of flour.